President Rodrigo Duterte has ordered Executive Secretary Salvador Medialdea to lead the government’s preparations to mark the 31st anniversary of the EDSA Revolution on February 25, 2017 . 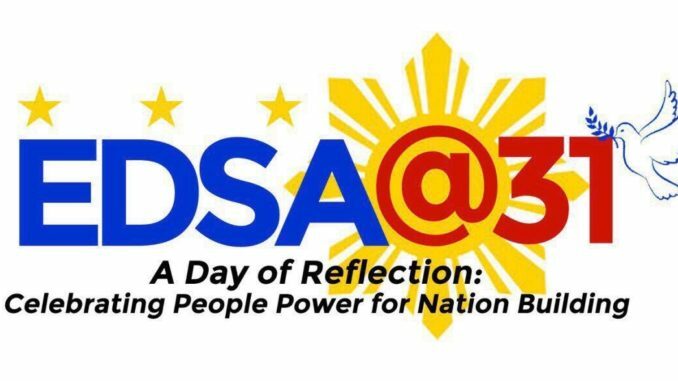 The theme for this year’s celebration is “A Day of Reflection: Celebrating People Power”. This month’s celebration of the 31st anniversary of the 1986 People Power Revolution would be “very simple and very quiet” and would highlight the need to move forward towards nation-building. “It’s time to move on from just celebrating the past, remembering the past and to move on into the whole aspect of nation-building, to give it a more positive outlook and… give (it) a more positive understanding,” Abella said at a press briefing. “It’s going to be a very simple and very quiet… Basically, the whole thrust is moving the nation forward from just looking back at what has happened in the past but moving forward to the future of the Philippines as everybody is encouraged to cooperate in nation-building,” he added.